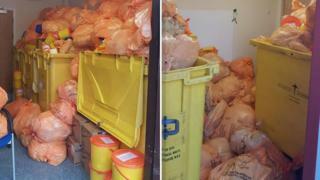 The images - from Coatbridge, Kilsyth and Cumbernauld - showed bags of waste on top of large waste containers. NHS National Services Scotland also said "appropriate contingency measures" were in place to process clinical waste after HES lost its service contract. However, one former HES worker, who asked not be named, said: "The firms who have taken over the collections are working flat out, but there is weeks and weeks of waste backed up." John Paterson, director of property and support services at NHS Lanarkshire, said. "The waste at Coatbridge, Kilsyth and Central (in Cumbernauld) Health Centres was uplifted between 9 and 11 January. "We have an agreed interim process in place to ensure that clinical waste is uplifted as and when required, while the national contract is resolved. "There was a delay in uplifts being requested with these three centres, but we have taken steps to avoid this in future. This was low level clinical waste that was bagged in accordance with procedures and held in closed-off areas. There was no risk to public health." A Scottish government spokesman said: "We regard the safety of all NHS employees as paramount. "The clinical waste contingency arrangements recently introduced across the country, have been risk assessed and safe systems of work identified, with appropriate protective equipment issued and made available to all staff."